Simple, easy and efficient receipt management at your fingertips. Managing your receipts can be a tough task. Trying to keep track of all those important business expenses and receipts can be a nightmare: pockets overflow, wallets become crammed with them and inevitably, many are lost. If you are claiming back expenses and/or the VAT then this can quickly become a significant cost and frustration. Over the years, as a firm of proactive accountants, we have seen it all. From envelopes and shoeboxes overflowing with receipts to carrier bags and plastic wallets. But now, thanks to our free app, there is a much easier way! As a modern, forward thinking firm we are always looking for new and improved ways of doing things. So when we launched our Apple and Android-Approved App, one of the important features was Receipt Management – a super easy way that all businesses (both clients and non-clients) could store and manage their receipts. And here it is, the Cottons Accountants Receipt Manager. How does the Cottons Receipt Manager work? Once you have downloaded our free Cottons App, simply click on the home page icon labeled ‘Receipt Manager’. You can take a photo using the ‘Photograph a Receipt’ button. Selecting this will automatically open the ‘Categories’ tab where it will prompt you to select the category you wish to save your receipt under – this can be a category like Travel Expenses, Property Costs, Personal Receipts and so on. Once you have selected the category for your receipt, you just need to use the camera on your smartphone or tablet device to capture the image. Don’t worry if you don’t quite get it in focus first time around – you will have the option to ‘Use’ the current image or ‘Retake’ for another go. Now it is just a case of completing the required fields. 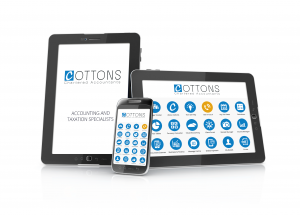 The Cottons App is available for all mobile devices. We’ve written up a complete summary of the Cottons App if you would like to know more. If you are a client you can download it now from either the Google Play or Apple app stores, and if your aren’t then get in touch with your local branch to talk to them about how our digital age accounting practices can help you. We have accountants in Rugby, Daventry, Northampton and London.